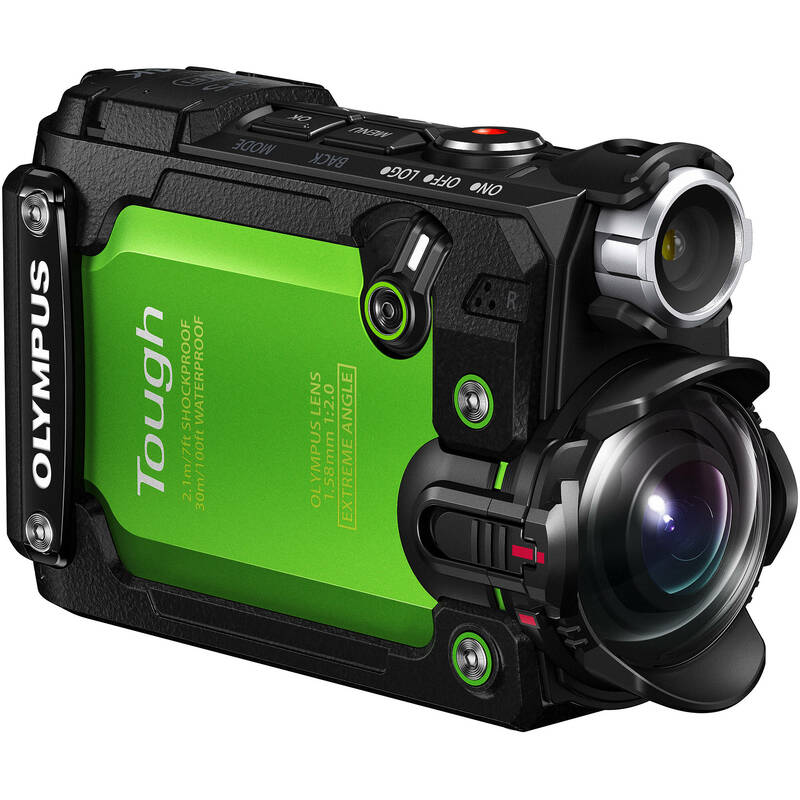 Proudly displaying the Tough badge of honor, the green Olympus Stylus Tough TG-Tracker is a rugged action camera ready to capture all of the action in resolutions up to UHD 4K at 30 fps. Compared to other action cameras, the TG-Tracker doesn't require a separate camera housing to provide its toughness, with its body shockproof from drops up to 7' and waterproof to depths of 98.4'. It's also dustproof and will operate in temperatures as low as 14°F, so whether you're at the beach on at the top of the slope, the camera is up to the task. Being tough isn't all the TG-Tracker has to offer. Besides high-resolution UHD video at 30 fps, you can record 1080p video up to 60 fps, 720p video up to 240 fps, and 8MP still photos. Equipped with an ultra-wide 204° lens, the camera is able to see practically everything in front of it, and even a bit on the sides. A built-in LED headlamp positioned above the lens lets you illuminate dark or dimly lit environments. You can confidently frame your shots using the tilt-out 1.5" LCD screen, or connect to a mobile device via Wi-Fi and use the Olympus Image Share (OI.Share) app to remotely monitor and operate the camera, as well as transfer files for immediate sharing. Box Dimensions (LxWxH) 7.85 x 6.0 x 3.55"
Stylus Tough TG-Tracker Action Camera (Green) is rated 4.8 out of 5 by 13. Rated 5 out of 5 by Robert H. from Excellent little camera I used this extensively while scuba diving during my recent trip to Hawaii and couldn't be happier with the results. It worked well during the day and at night when we dove with the Manta Rays. I was blown away with how good the video is--sharp, excellent color rendition and the image stabilization worked like a champ. I shot without the pistol grip and it was not an issue; in fact, it's so small I could cradle it in my hand and keep it quite steady. If you're looking for an affordable video camera to shoot underwater I highly recommend the Olympus Stylus Tough TG-Tracker Action Camera. Rated 5 out of 5 by Mr Builder from Nice multi feature action cam Great build quality and crisp pictures. Video is nice. Very cool features and sharp looking camera. Rated 4 out of 5 by Tom Fisher from Excellent, but Great camera features at a wonderful cost. The "fish-eye-only" lens is a tragic flaw in the design however. If Olympus fixes this problem (adjustable FOV) then they have something truly great. Rated 4 out of 5 by mjr from Great Camera, HORRIBLE Software for the extra data Overall, I really like this camera. Unfortunately the software developers at Olympus have almost made all the features that make the TG-Tracker stand out from the crowd irrelevant. For that reason Im giving it 3 stars. If you don't care about all that extra telemetry it's probably a 4, if not 5 star device. So, short review is; great camera that can be even better in the next version. Absolutely horrible software solution. And if you want to use the GPS, Elevation/Depth, Compass, and Temperature data that is probably why your are considering this and not a comparably price GoPro Session, the software makes it such a chore thats its almost not worth dealing with. Hardware: I've mainly used this camera for scuba diving, going down to about 80 feet with no issues. But I did play with it mounted to my car as well. It did a fantastic job underwater. Ive shot in both HD and 4k, and both are excellent quality. Battery life, even with tracking on seems to be very good. I changed out batteries after each dive (about 45minutes) but the indicator makes me belie I could have maybe gotten 2 dives, or more, out of 1 battery charge. I also found that I like feature they called loop. You can set it to record a series of videos of a set length. So my dives where recorded in a series of 5 minute videos. But its not quite perfect. You cant delete or rename the data log files. This is my biggest complaint. I ended up with 4 or 5 short logs and 1 long one that I wanted. But when you go to import them with the software there is no way to know which one you need. You can erase video files, or everything on the card. Not just the data log files. I find the buttons to be a bit too close together. I dont think it will be very easy to operate anything but the record button and on/off with even thin summer mountain bike gloves on. I couldnt get it to switch to data mode and display the compass on the screen while I was underwater. I cant find anyway to disable sound recording. In most of the ways I intend on using this camera recording sound serves only to take up space and decrees recording time. Its all or nothing with Temperature, GPS, Compass, and depth/elevation data. The flip out screen is nice, but at least a 180 degrees of rotation would be more nice. The software is where I have some major complaints, First, and perhaps biggest, is the fact that the only software (OI.TRACKER) that can make use of all that cool extra data ONLY RUNS ON A PHONE/TABLE. THERE IS NO COMPUTER VERSION OF OI.SHARE. Your phone/tablet probably cant work with or handle 4k video, even if OI.Share would import them, which it wont. So all that cool telemetry you captured cant be overlaid on a 4k video. I tried processing the videos with overlay on my Galaxy S7 and on an Asus ZenPad S 8.0. The software just kept crashing on the Galaxy. On the Asus tablet it failed on average 3 out of every 4 times. The instructions for working with video is very vague. Its clear that this software was written for JPG files, not video. After some trial and error I learned that you must first import your HD files, cant use 4k, with OI.Share, then you have to use OI.Tracker to import the data file that has all the cool telemetry. THEN you use (try to use) OI.Tracker to overlay the info onto an HD video (cant be 4K). I seriously hope Olympus has some strong words with whomever is in charge of these decisions and has them create a PC based version of OI.Tracker so I can use my 3.6 ghz i7 processor to get that cool information onto a 20 minute 4K video. For now Im stuck with HD video being processed on a 1.3ghz tablet. Next you MUST import files over the wifi connection with the camera. The software will NOT import video or data logs from the card if you take it from the camera and put it into your phone/tablet. And lastly, the stupid software disconnects the wifi from the camera after every transfer. The process is 1) hook up wifi. 2) open OI.Share and import a video (gotta do them 1 at a time because the software can't use my 128gb card) 3) realize you grabbed wrong video. 4) hook up wifi 5) use OI.Share to get video 6) hook up wifi 7) Open OI.Tracker and import data log. 8) realize you didnt get right data log. 9) hook up wifi 10) import another data log 11) attempt to export HD video (no 4K) with overlay. 12) wait 15 minutes to discover video export failed. 13) repeat step 12 14) repeat step 12 15) repeat step 12, only with success. 16) repeat steps 1, 2 and 11 to 15 for next video. For all my complaints Im not unhappy with the camera, Im basically in the same place Id be if I bought a GoPro Session and an underwater case. At least I dont have to worry about the case I guess. And I'm really hoping Olympus software gets their act together and creates a PC solution to working with this camera. Dare I hope that it's a 1 application solution, and not 2 separate ones? Rated 5 out of 5 by Echolima from Great Great little camera. It's surprising how small it is. It feels really sturdy and high quality. The underwater mode gives really impressive results without the fisheye effect of the normal mode. How does this mount on a helmet or tripod? On the bottom of the camera is a 1/4 -20 mounting hole. You can mount the camera directly to a tripod with it. Then, if you remove the handle from the included pistol grip, the remaining piece is attached to the bottom of the camera and provides the universal two-prong GoPro mount. You then employ any of the plethora of action mounts available, including ones for helmets. GoPro Side Mount Kit B&amp;H # GOAHEDM. GoPro Helmet Front Mount B&amp;H # GOHFM GoPro Helmet Strap B&amp;H # GOVHSB. Is there a red-filter lens available as an accessory as well to use underwater? No - but there is an underwater mode that will offer the red filter compensation. Can the data logs be transfered and read on a PC? Is there a procedure to reversevideo 180 degrees? My videos come out upside down when reviewed. Unless the camera has a flip picture option in the settings, the next easiest solution is to simply flip the video in a computer using any video player (Quicktime, Windows Media, etc.). is there any stabilization like the Sony's have? It has digital image stabilization same as the Sony Action Cam's. The pictures show a dome port in front of the lens, is the camera optically corrected for underwater use? This was not the case with the older Gopro 2 which also had a dome port. The bundled UP-T01 Underwater Lens Protector is required to shoot underwater. Without it, the camera will not be able to focus underwater. The angle of view becomes narrower underwater; users must change the camera's angle-of-view setting to Underwater . Does the wi-fi in the camera have enough range to support FPV flying paired with tablet or app? The Built-in Wi-Fi for remote monitoring, control, and file sharing is designed for short-range use under 30'. Does this have International Warranty? The warranty from Olympus is USA only.